The 8th YAMAHA ASEAN CUP RACE Held in Malaysia | Yamaha Motor Co., Ltd.
Yamaha Motor Co., Ltd. announces the holding of the "The 8th YAMAHA ASEAN CUP RACE in Malaysia" over the two days of December 11 and 12 at the Hang Jebat Stadium (Malacca, Malaysia / overall length: 1,101m) hosted by Yamaha Motor group's Malaysian distributor, Hong Leong Yamaha Motor Sdn. Bhd. (HLYM). Launched in 2003, the YAMAHA ASEAN CUP RACE is a one-make* international championship race competed on Yamaha 4-stroke sporty mopeds by riders who have won national qualifying races. For this 8th holding, the Expert and Novice classes will be competed by a total of 38 qualifying riders from Malaysia (the host country), India, Indonesia, the Philippines, Thailand, and one special entry from Japan (Novice class). The Expert Class race machine will again be Yamaha's flagship 4-stroke moped T135 (Malaysia market name: 135LC), while the Novice Class machine will be the new model T115 (Malaysia market name: Lagenda 115Z) released in the ASEAN region beginning in December 2009. There is a growing interest for motorcycle sports in the ASEAN region, a main market for Yamaha Motor's arterial marine and motorcycle businesses. In recent years a growing number of young people have demonstrated a desire for a more active lifestyle. In response to these trends, the Yamaha Motor group is involved in a variety of activities that strengthen its sporty and stylish brand image while promoting the development of motorcycle sports, contributing to youth development in the ASEAN region. The YAMAHA ASEAN CUP RACE is an exemplar symbol of such activities. Yamaha Motor group's Malaysian distributor HLYM is hosting this event for the third time among the participating nations. * A one-make race is a type of motor sport in which all the competitors use the same make and model. The YAMAHA ASEAN CUP RACE is competed in two classes, the Novice Class and Expert Class, with each class competed in a two-heat race format and the final places being decided on the basis of total championship points for the two heats (2nd heat results used in case of tie). The races are competed using machines that have been set up to the same specifications and conditions, and the machines to be used by each team are chosen by lottery. For the first time this year, a minimum weight limit has been introduced to ensure fairness, due to the increase in younger, smaller framed competitors with a weight advantage. Awards of trophies and prize money are presented to the top five placements in each of the two classes (Novice and Expert) and another trophy is given to the country whose riders score the highest total number of points. The machine to be used in the Expert Class is Yamaha's deluxe sporty moped, the T135. This model was unveiled in autumn of 2005 as Yamaha's next-generation deluxe moped. 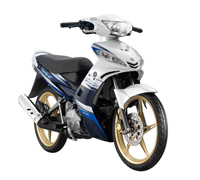 Developed around a concept of a "Performal Moped" that brings together "performance and formal" product aspects, this model is Yamaha's flagship in the moped category with its attractive fusion of high performance and fashionable styling. Its liquid-cooled 4-stroke 135cc engine boasts exclusive Yamaha technologies like the DiASil cylinder and a lightweight aluminum forged piston. This model has quality that is one rank above the rest in all aspects, from its excellent design to its sporty performance and environmental friendliness. These characteristics have won it a popular acclaim in the ASEAN countries. Yamaha Motor believes that giving the Expert Class riders experience using the high-performance T135 will help improve their racing skills. For this reason, local 135cc class races have been organized on a wide scale since 2006 in the participating countries. It is also why we have chosen to use the T135 as the race machine for the Expert Class from the 4th YAMAHA ASEAN CUP RACE in 2006, as an event for riders from the ASEAN countries who hope to move up to world-class racing. The T135 is chosen by many riders in national championship series in the region because of its highly competitive performance. The race machine for the Novice Class is the new T115 released in Indonesia in December 2009 and in Vietnam and Malaysia in 2010. This model is the successor to the popular ASEAN market model T110 that was the original race machine for the YAMAHA ASEAN CUP RACE. 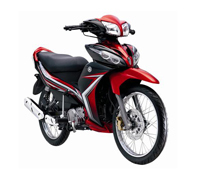 T115 is a model developed under that product concept of "The Sporty Premium Moped" and it lives up to that image with not only its performance and economy but a great balance of "Ease of use for a pleasurable ride" and "Quality feel." It is powered by an air-cooled 4-stroke 114cc engine mounted on a newly designed frame to achieve a smooth and sporty ride that is also comfortable for long distance, high-speed cruising. It also features new body styling that makes abundant use of curved surfaces in creating an image of luxury and high performance. On race day, the T135 and T115 models used for competition in the two classes will sport the official Yamaha racing color, blue, and the Yamaha "Speed Block" graphics as the basic design. To this will be added the national flag and original colors of each country's team on the front cowling. Since the 1980s, Yamaha Motor group has undertaken a variety of activities aimed at the popularization of motor sport in the ASEAN region. These include active promotion of programs aimed at building the race population and raising the level of competition, such as support for national championship competitions and Yamaha Cup races in each country, organizing Yamaha "Racing Academy" programs aimed at improving rider skills as well as training riding instructors. Continued promotion of these activities has led to a rapid rise in the level of competition in each country and stimulated the riders to strive to new heights. Among these are an increasing number of riders who are striving to compete in the YAMAHA ASEAN CUP RACE by qualifying in local Yamaha Cup races and national championships, while some also set their sights on the FIM Asian Championships and World SuperSport Championships. As the number of young participating riders increase, the number of people coming to the circuit as families is also increasing, which in turn means that more people are involved in motorcycle events as a whole in each of the participating countries. Within this context, Yamaha Motor has initiated a support system for the YAMAHA ASEAN CUP RACE Expert Class winners who satisfy conditions laid down by Yamaha Motor (including age limits and support requirements specific to each country). 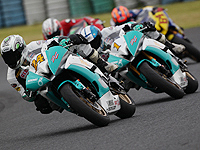 The support includes instruction, lending of race machines and training of mechanics, etc., all with the aim of helping the riders and teams improve their skills step-by-step to the point where they can participate in the FIM Asia Road Race Championships, the All Japan Championships and eventually the World Championships. A trial demonstration will be offered to introduce the enjoyment of motorcycle competition as a spectator sport and the amazing handling skills that motorcycle riders can acquire with practice. Trial riding is a type of cross-country motor sport that is especially popular in Europe. Unlike other motor sports competed for speed, trial involves clearing obstacle "sections" with mastery of handling skills. 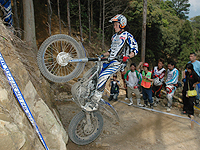 Giving a demonstration of the high-level techniques of the sport this time is Kenichi Kuroyama, a 9-time All Japan Trial champion who has been competing as a Yamaha rider since 2006. 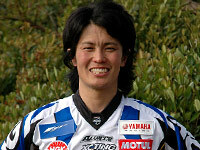 He ranked 2nd in this year's All Japan Trial Championship on the Yamaha TYS250F and is currently one of Japan's leading trial riders.